Happy Sunday my friends! 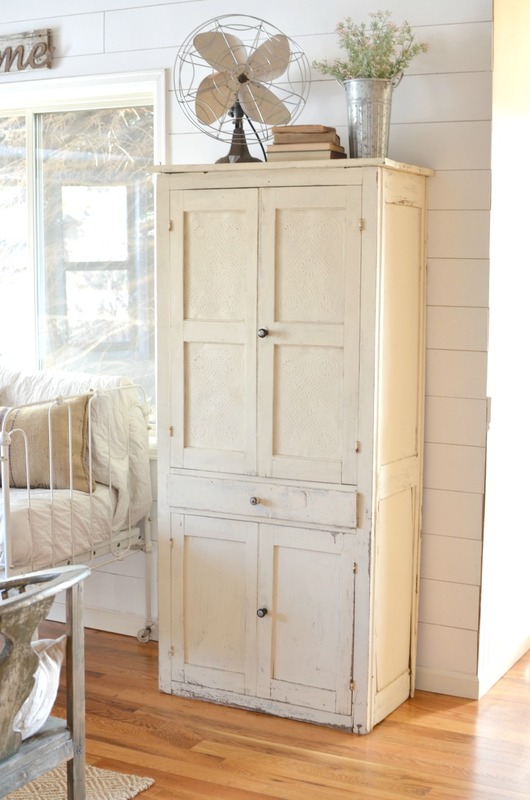 Grab your coffee and get cozy, because today I’m sharing the most gorgeous vintage yellow pie safe. I’m seriously obsessed with this thing and sooooo excited to share it with you all today. This pie safe originally belonged to a distant family member for decades and decades, but my mom was lucky enough to get it many years ago. She used it on her back porch for years, meanwhile I’ve been begging her to let me “borrow” it. Well, she finally caved. My parents actually came for a visit last weekend and surprised me with this pie safe. I was literally jumping up and down with excitement. It was better than Christmas morning. I spent the week cleaning it up and styling it in our front room. When I was photographing it for the blog I found myself just standing in front to it, staring in awe at the beauty of this old cabinet. I think I took about 291 pictures of it. I just can’t believe it’s finally in my home. 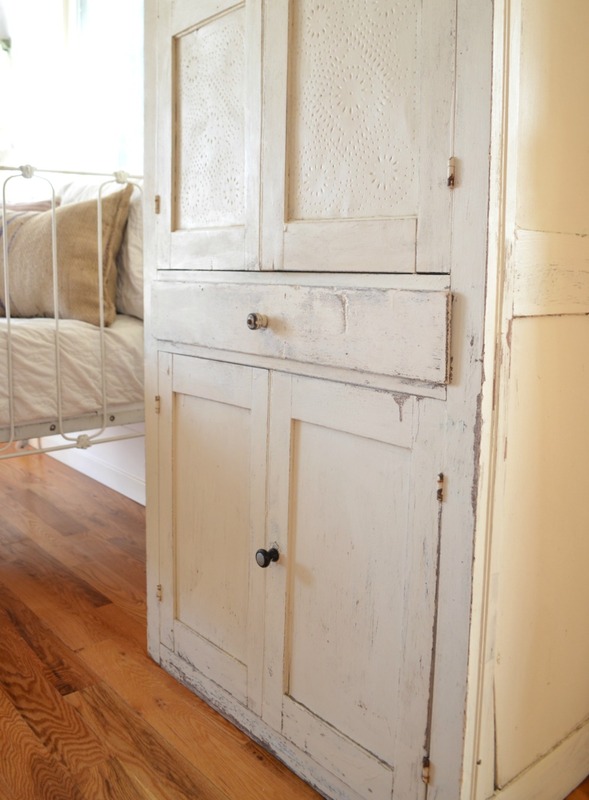 I love these tin panels and the old door knobs, they add so much character and charm to this piece. It was painted this light yellow color when my mom received it years ago. I actually love the color and I have no plans of changing it. I know I say this about a lot of things, but this is truly one of my favorite pieces in our home. I’ve admired this pie safe from afar for years, so it’s just so awesome to finally have it here in our home. There is so much history here and old beauty that makes my heart skip a beat. I wish I knew more about it. Since the tin panels look to be machine-punched, we’re thinking it was likely made in the early 1900’s. I’m going to research it more, but either way it’s bursting with history. 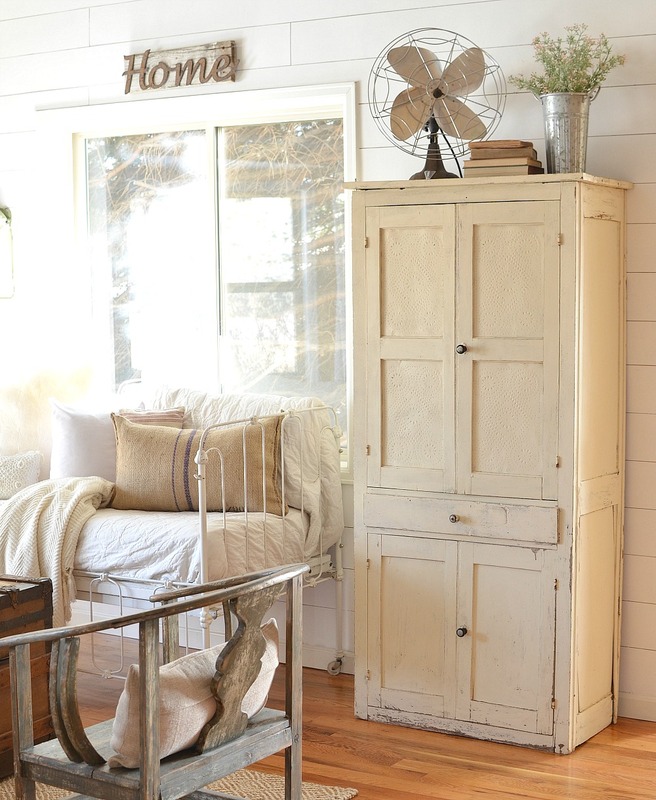 This is the reason I love vintage so much–every piece has a story. 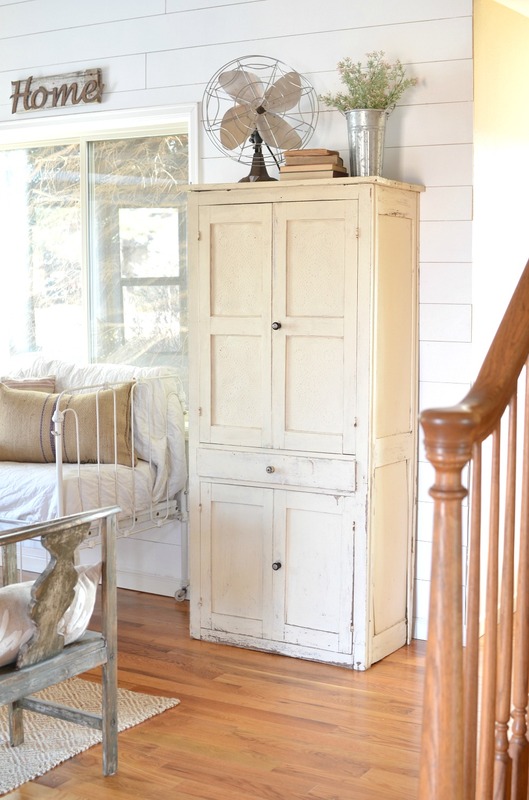 It’s like I have a little bit of the past in my home and this sweet vintage pie safe definitely has story to tell. The next chapter starts here! Thanks for dropping by today my friends. Let me know what you think of this pie safe, I’d love to hear it! I can see why you love it so much, it is beautiful!! It looks perfect where you placed it. Lucky you!! It is a lovery old piece!! If it were mine, I would keep it; especially since it holds very special memories for you. It looks awesome, Sarah. I love it and it fits perfectly in the spot where you have it. What a gorgeous pie safe. The pierced tin panels are what makes it so unique. These were very common in the late 1800’s and every up to date home had one. This is where all their food was stored since they didn’t have refrigeration. The pierced tin was to allow air to flow through but keep the bugs out. Many of these were sort of mass produced and then hundreds of them were crafted by traveling cabinet makers or the farmer himself. 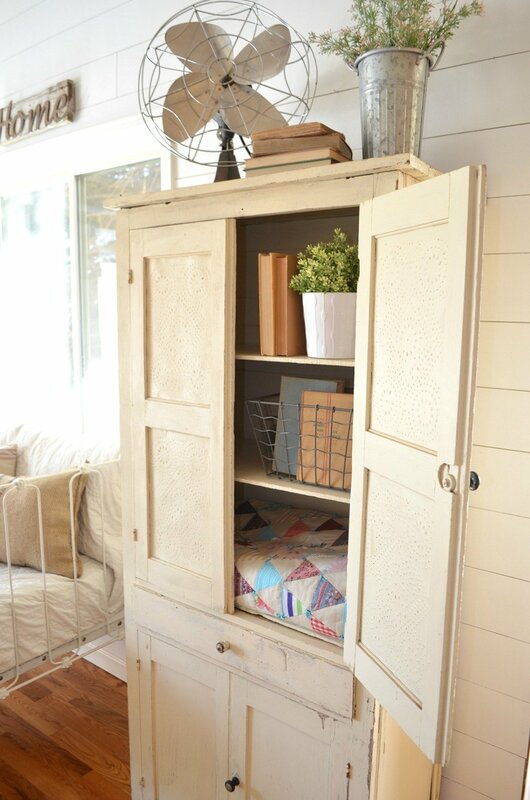 He would make a cabinet for his wife and then she would pierce the tin in a quilt pattern design. I had one years ago that had a date on it of 1878 and a farmers name. Oh wow! Thank you for all the info Marty! I find it so fascinating to learn about the history and story behind a piece. It’s my favorite thing about vintage decor. I wish this one had the date written on it like yours did, but I haven’t found anything on it yet. I’ll keep looking! It is beautiful Sarah, do you know the name of the color of yellow. I love the color. I know you will cherish it. I have a small trunk that my great grand parents brought over from Germany. I am in the progress of redoing it. My Mom had started it and never finish it, so I am going to try and finish it. Wish me luck. I wish I knew the name of the color Jonita, but I don’t. It sure is pretty though. Not too bright, not too dark–the perfect antique yellow. Good luck refinishing your antique trunk, I’m sure it will turn out beautifully! She’s definitely a sweetheart to let me have it! Thanks Mary! It is the perfect addition to the room. I love the piece and how you styled the top. It adds a perfect weight & balance to this space! It’s so pretty. Oh wow! I’m sure that is gorgeous Jacinda. And what a great idea! I always love a piece with a good story. That pie safe is gorgeous. What I could do with that. Enjoy. Love the pie safe! It looks right at home! I’ve been following you on Instagram for a while, and just recently subscribed to your blog….your posts and photos and ideas are so inspiring! But, I still haven’t received the farmhouse printable – can you email one to me please? 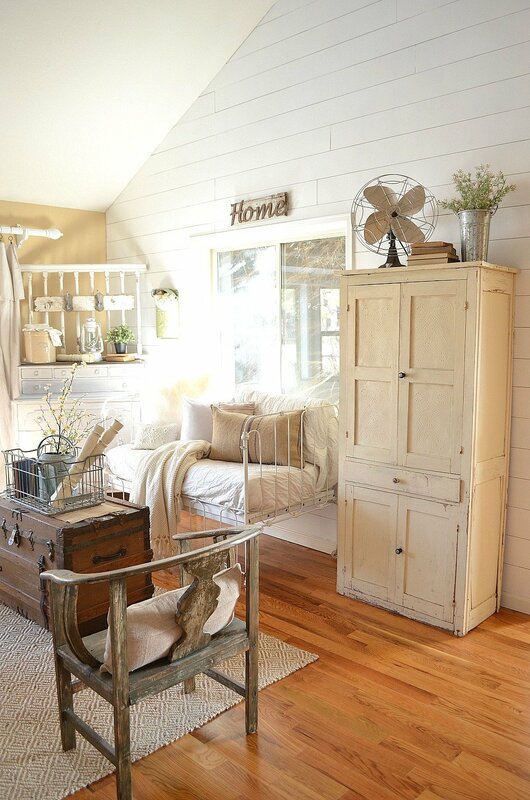 I have the perfect chippy white barnboard frame waiting! Thank you! That’s so weird! I’ll send you one now Laurinda. What a beautiful piece of furniture! I love when something has a story, it makes my heart skip a beat, too! It looks so perfect in your home. 🙂 Also, can I ask where you got that vintage fan?! I need one! Thanks Jolene! I found that vintage fan at an auction this past summer. Great find! 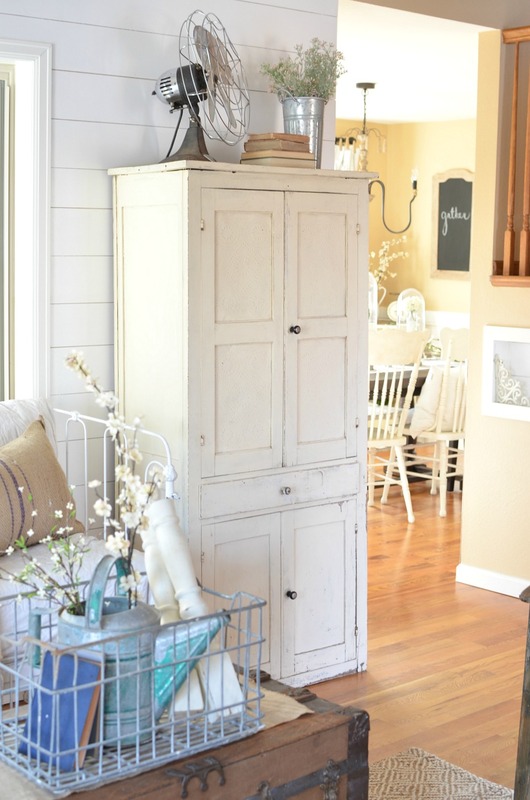 It is the perfect addition to your home…..I love it! I love the color! The perfect yellow. You’ve styled it beautifully, too. I know the feeling you have when you received it from your mom. I am the very proud owner of my grandmother’s pie safe. I use it in my guest room. It holds a quilt, my collection of vintage children’s books, my mother-in-law’s framed Church Nursery School certificate and some other knick knacks from past generations. If I could figure out how to share a photo, I’d post it here. But, alas, I don’t know how to do that. Thanks for sharing! I thoroughly enjoy your blogs and your style. It sounds beautiful Tricia! I’d love to see it. You can always email me at [email protected]! I’m so excited for you! What a treasure. I have one just like this as well. My mother in law passed her great grandmothers pie safe down to my husband and I. I was so honored and will always cherish this special piece. Love your blog! You are so talented and inspiring. Oh that’s awesome Shanon! Lucky you. It’s definitely an honor to inherit treasures like this! So pretty, I love the color too! Your parents had to be sooooo excited when they packed that pie safe for you…..such a treasure and your joy made it all worthwhile for them. Enjoy this special piece and playing with the styling of it for all the seasons…..or leave it as it is, and gosh, it is just perfect now! Oh I know they were so excited Patty! I’m just lucky they’re kind enough to share their treasures with me. Ooooo, so lovely!! I wish my family had saved more heirlooms like this. 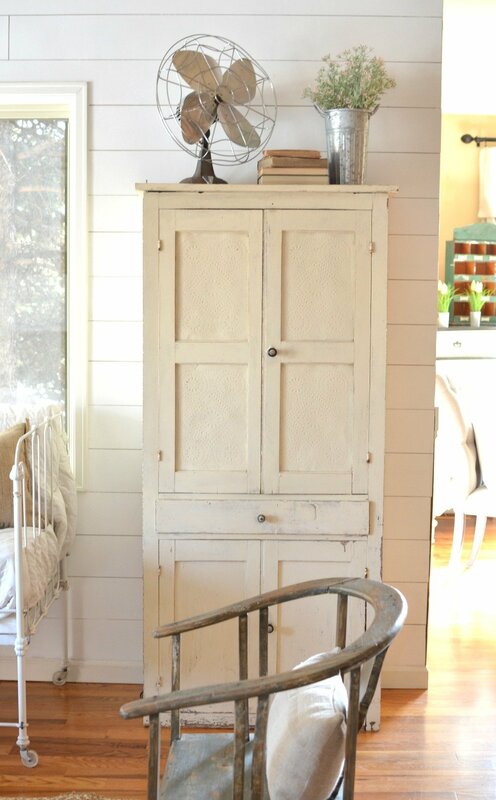 I just love the stories and history that come with vintage pieces. I am pretty lucky, that’s for sure. My mom has loved antiques her whole life, so it’s always fun when she shares! OH, Sarah!!! This is gorgeous!!! Bless your mother’s heart! I have given some of my special things to my children and I love seeing them in their homes! It’s beautiful, and perfect just as it is! I’m glad that you aren’t planning to change it! It is just lovely! The pie safe looks like it was made just for that very spot. 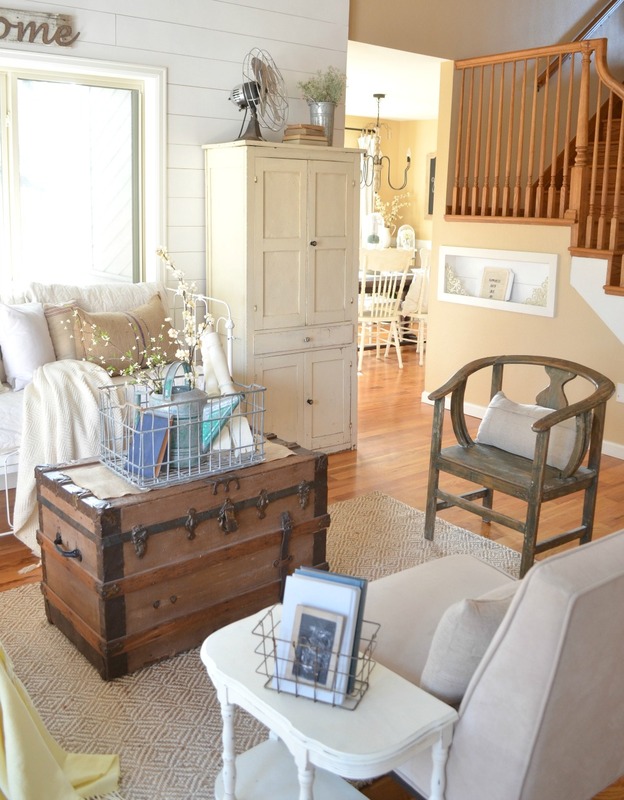 Character, charm and a wee bit of cozy all tucked into one sweet piece. Enjoy…. ( oh the stories it could tell)! Sarah, what a beautiful piece of vintage the pie safe is. I love it and it looks beautiful in your home. Enjoy it every day. You lucky girl! I love it 🙂 It looks perfect in your room! 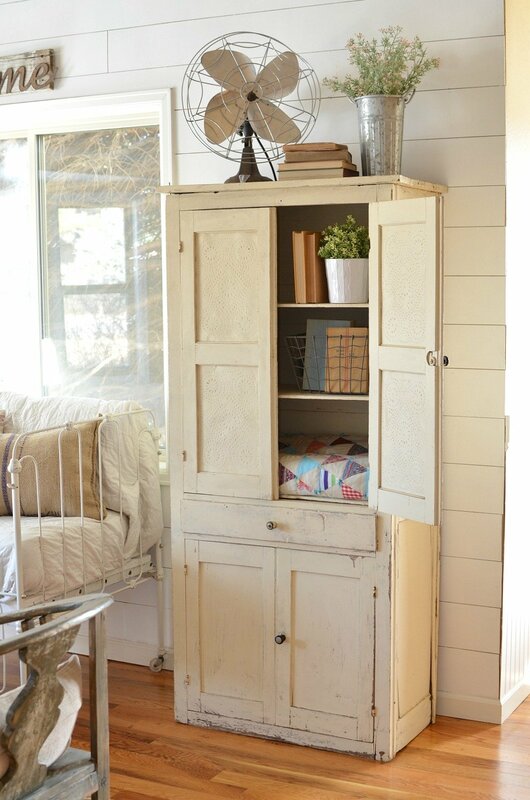 Love, Love the cabinet. Your whole house is beautiful. Is the daybed old? I have been looking for one that could be used like that.